At Elite Trimworks we strive to bring new and innovative products to our customers. Although the use of Oak, Maple and Cherry in Wainscoting is nothing new, allowing a homeowner to install it in a room, in less than a day at a reasonable cost is revolutionary. Until recently the trouble was, if you wanted wainscoting you either had to make-do by faking the look with trim applied directly to the wall or spend a lot of money on a custom carpenter and custom-shaped panels. 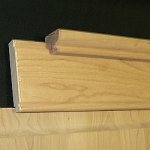 By using hand selected wood and precision production techniques, Elite Trimworks makes installing your own wainscoting a viable option. Our wainscot kits come shaped and sanded but otherwise unfinished to allow you to stain or varnish the wainscot to suit the decor of the space in which it will be installed. Whether you are a do-it-yourselfer, a contractor or you've hired a carpenter to install our product for you, our pre-manufactured kits save time and money on the job site and come with detailed installation instructions. If you need any help, simply contact us, our helpful staff is always available. Wainscoting rails come in one standard 8 foot length, resulting in a calculated yield with a uniform grain pattern. The MDF substrate is more stable and does not twist or crack like solid wood. Vineered profoles have minimal knots and do not require grain filling or heavy sanding required. Wrapping grade veneer is pre-sanded.